This is another great dish from my favorite cookbook Plenty: Vibrant Vegetable Recipes from London’s Ottoleghi. Grilled marinated artichokes, Kalamata olives and various vegetables add distintive and diverse texture to this rice dish. This rice dish might be too light for some people who are used to big meaty dinner portions, but it made a lovely dinner with a little green salad and a glass of Côte de Provence rosé. Add bay leaves, paprika, tumeric & cayenne pepper and stir well. Add the rice and stir vegetables and rice together thoroughly for 2 minutes. Add the sherry & saffron and boil down for a minutes or so. Then add stock & 1 tsp salt and simmer very gently for 20 minutes until most of the liquid has been absorbed by rice. Do not cover or stir the rice. Remove the paella from the heat, taste and add salt and pepper, if needed, without stirring too much. 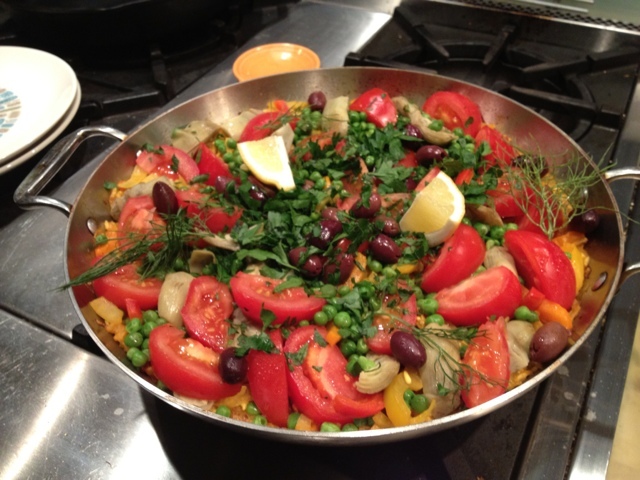 Scatter the tomatoes, artichokes and fava beans over rice & cover the pan tightly with foil. Leave to rest for 10 minutes. Take off the foil. Scatter the olives & sprinkle with parsley. Serve with wedges of lemon. This entry was posted in Recipes and tagged paella, rice, Spanish, vegetarian. Bookmark the permalink.